The Washakie County Conservation District (WCCD) encourages property owners to plant effective windbreaks to protect buildings, cropland and feedlots, for erosion control, reforestation, and other conservation practices. An important aspect of planting trees or shrubs is that you plant the right tree in the right place and there are a number of things to consider and do before you plant. First take a good look at the area where you want to plant. Are there overhead power lines, or buried utilities? Do you know the local ordinances regarding planting along roadways or streets? Always keep in mind the size of the mature tree when planning a planting. Will the trees crowd structures or cause drifting snow in an area you don’t want? How will the trees be watered and what about the weeds? WCCD has several publications available to you that include tree and shrub species information and selection. 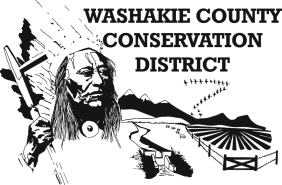 The WCCD , Tree and Shrub Guide focuses not only on species that do well in Washakie County, but also includes planting tips, pruning tips, watering, and fertilization information. Several other brochures available for download are the Colorado State Forest Service's Trees for Conservation Guidebook, and the Wyoming State Forestry Division's Wyoming Tree Owner's Manual. This is a comprehensive guide for tree care information and guidance and covers a wide range of topics including; selecting the proper tree, planting, pruning, how to hire an arborist and tree removal, to name a few.